The Key West Tropical Forest & Botanical Garden is an arboretum and botanical garden on Stock Island in Key West that is home to a collection of palms, shrubs, and several award-winning trees. The venue is also a spectacular tropical paradise for weddings, social occasions and special events, year-round with several sites ranging from the Butterfly Garden, which is perfect for intimate wedding ceremonies to the idyllic Courtyard for elegant and grand receptions. The venue also offers a range of exceptional services such as a bridal suite and groom’s dressing room, subtle outdoor lighting, an onsite manager to take care of all the detail and ensure a hassle-free day. The Key West Tropical Forest & Botanical Garden features several sites which can host a variety of different events from romantic ceremonies to lavish receptions. 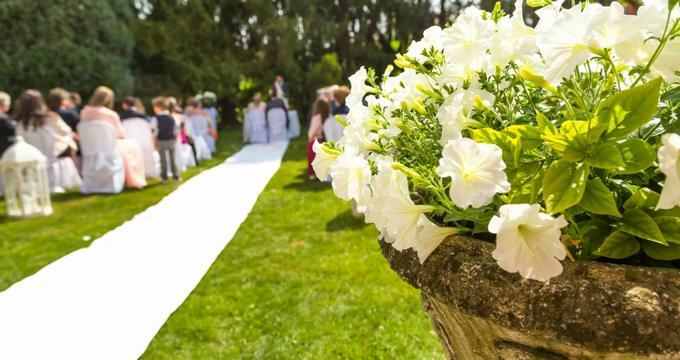 Designed by renowned landscape architect Raymond Jungles, the beautiful tropical venue offers three picturesque outdoor event spaces for special celebrations, including the one-acre Butterfly Garden, a small and intimate area for private wedding ceremonies. The Butterfly Garden caters for 50 standing guests and 25 people for a seated dinner. The idyllic and tranquil Courtyard features a raised stage for romantic ceremonies or presentations and speeches and a falling waterfall as a beautiful backdrop for ceremonies and receptions. Surrounded by lush tropical gardens, the Courtyard can be covered by a tent in inclement weather and can accommodate up to 100 guests for seated dinners and 130 guests for cocktail gatherings. The scenic lakeside Terrace is ideal for grand receptions of up to 200 people with breathtaking natural scenery, twinkling overhead lights, and ample space for dinner and dancing beneath the stars. The Lakeside Terrace can accommodate up to 200 guests for a buffet dinner with partial seating and no dance floor, and up to 150 guests for a seated buffet dinner and dancing. Services offered with the rental of one of the spaces in the Key West Tropical Forest & Botanical Garden include the use of a bridal suite and groom’s dressing room for each party to get ready and relax before the big event, outdoor lighting, an onsite manager to handle all the details on the day, a security guard at the venue for the duration of the function, and a large parking lot with complimentary parking for guests. Also offered is a list of preferred vendors for services such as catering and beverage services, floral arrangements, DJ services, music and entertainment, photography and videography services, wedding cakes, officiants, and limousine, shuttle and valet services. Key West Tropical Forest & Botanical Garden is located at 5210 College Road in Key West, is wheelchair accessible and offers complimentary parking for guests in a large parking lot at the garden.